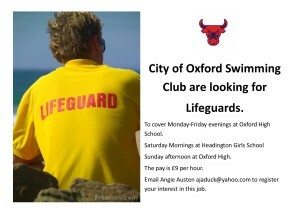 To cover Monday-Friday evenings at Oxford High School. Sunday afternoons at Oxford High. The pay is £10 per hour. If you are interested in becoming a lifeguard the next course is October half term and costs approximately £220. As a member of COSC if you work 25 hours for us within 6 months, the club will reimburse the cost of the course. For more information please contact Angie Austen ajaduck@yahoo.com. We are looking for a Level 1/2 ASA Swimming Teacher to start in September 2018. The position is for Saturday Mornings from 11.30am to 1.00pm at Headington School, Oxford pool. The successful candidate will be involved in our swim school lessons that are accredited to Swim England stages 1 to 6. Please contact Liz-basterfield@hotmail.co.uk for further information and to express your interest in this position. If any of these roles are of interest to you and you would like more details, please let me know.